The temperature is rapidly rising and it’s beginning to feel like summer has officially arrived here in Southern California. Warmer weather means more soap making at the Lavender and Olive household and I already have three batches of new creations curing in the wooden crates, waiting patiently until they’re ready to be loved and enjoyed, in about four weeks. My latest batch is this all-natural Olive Oil soap with Eucalyptus, Lavender, Rosemary and Tea Tree scents. And just for fun, I made this 30-second clip capturing how the oil and lye mixture turn into soap! I hope you enjoy watching the transformation! I’ll make a full, “how to” video tutorial soon! Sometime, I wonder if I should just get real and rename my blog to “Things I Purchased at LUSH,” or “Homage to LUSH,” or “How I Got Suckered Into Purchasing Things I Don’t Really Need at LUSH … Again,” or something that shows how addicted I am to this cosmetic joint. I’m not a fan of every product there (some are too strong in scent and some are just outright weird) but I seldom walk out of the store without a bagful of items that I never knew I needed but could no longer live without. My latest acquisitions were a bottle of rose and lavender toner water named “Eau Roma Water” (eau my!) and a small container of Rose Cheeks fresh face mask, from the store in Portland’s NW 23rd Street, aka “Trendy” Third. If you haven’t noticed, I love all things rose. One good thing about a visit to LUSH, other than brining home fun skincare products, is that the place reignites my love for homemade cosmetics. Every time I leave the store, I come out with a motivation to start creating again. As soon as I got home from Portland, I got busy making a batch of Marseille soap. I scented it with Lemongrass, Lavender, Rosemary and Sweet Orange Essential Oils. I can’t wait for it to become ready in about a month! One of my favorite soaps on the market today is Rose Geranium with Rosehips and Shea Butter from The Soap Kitchen. It’s incredibly decadent and its feminine, rose-like scent is out of this world (Although rose and rose geranium are from a different plant family, they do share a very similar floral scent). I feel that this soap captures everything I love in handmade soaps – warm color, luxurious lather, with a subtle but a splendid presence of flower-y sweetness. I pick one up every time I go into the lovely store in Old Town Pasadena and I must say that it’s a lot more frequent than I’d like to admit. I tried recreating these sumptuous soaps at home and I’m in love with how they came out! It’s no secret that I totally tried to replicate my favorite The soap Kitchen soap as best as I could (imitation is the sincerest form of flattery, right?). Although they’re not exactly the same, I think I was able to capture the essence of my favorite soap in this handmade version. Note: The scent of citronella Java essential oil was pretty dominant during the curing stage but it slowly neutralized into a subtle lemon-y scent. The color also became a lot more subtle as the soap bars dried. At first, the soap loaves were deep burgundy and I panicked. I’m happy that it ended up becoming a lovely dark pink hue. My friend D recently introduced me to this lovely café in Pasadena called Lincoln. We had an early lunch there after running a lap briskly walking and conversing around Rose Bowl one morning. I thought about taking photos of the chic industrial restaurant interior, the colorful array of candies and pastries that fill the cafe, as well as breakfast and lunch served beautifully on simple, white ceramic plates and bowls with edible flower or two on top, but I couldn’t because my two-and-a-half-year-old daughter took hostage of my iPhone to watch cartoon during the meal (Mom of the Year here, I know). Instead, please do read Jonathan Gold’s Los Angeles Times article detailing all the delicious dishes it serves up! So, why talk about the restaurant when I have no photos or stories to share, you may ask? Well, it’s because I found something perfect for my soap-making adventure there! How random, I know! Next door to the café is an auxillary gift shop, where patrons can find hand-selected, Anthropologie-esque items such as books, candles, ceramics, etc. While browsing the shop, I came across a stack of wooden crates available for sale for $8 each. I picked one up and knew immediately that it would be perfect to complete my soap drying rack. I’ve used shoe rack to dry the handmade soaps but I had to get rid of it once my daughter was able to crawl. I could not longer have anything on the floor where she can easily reach. I recently purchased three-tiered oven rack but couldn’t find anything that would fit. Then came these Loncoln-logo-branded creates! Yipee! I purchased two but went back two days later to pick up four more. The search for the perfect drying rack is finally over and I couldn’t be happier! I’m currently drying Olive Oil soap with dried spearmint leaves on the top rack, and another Olive Oil soap scented with Eucalyptus and Lavender Essential Oils on the bottom. 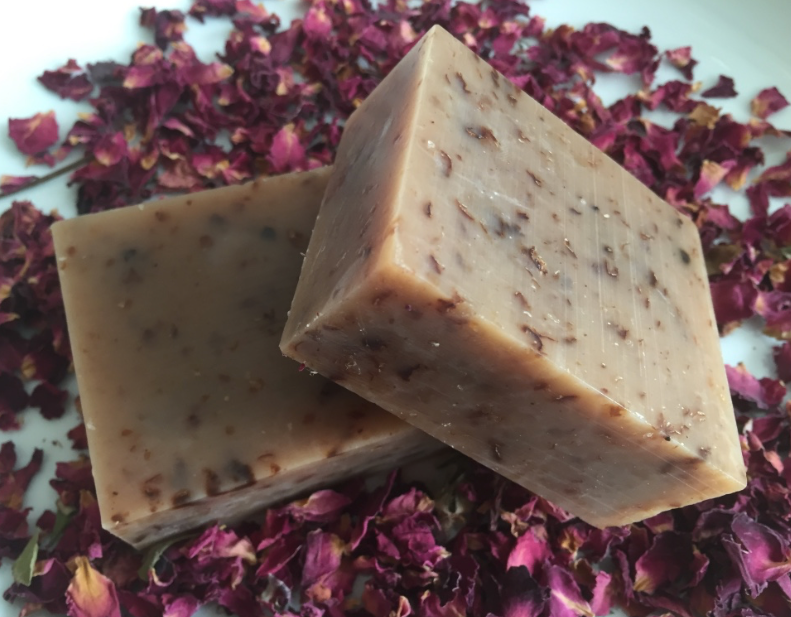 I named my business, as well as this blog, Lavender and Olive because they are two of my favorite ingredients in a soap recipe, as well as to eat. But it could have easily been called Olive and Avocado, or Avocado and Lavender, or any combination of the three because, holy guacamole, do I love my avocados. They are equally delicious in handmade soap, and in a sandwich. I would have to say that this Double Avocado Soap is my favorite original recipe. It has a beautiful milky white color that I love in a soap, and a nice firmness that I strive to achieve in each bar of soap I create. But the most amazing part is the stiff and bubbly foam it creates when you lather it with a body sponge and your skin will feel baby soft all day long. It’s simply amazing. I scented the soap with Yuzu fragrance oil. The lovely sweet citrus scent is so refreshing that I kept smelling my skin all day long. Confession: I was a little hesitant to share this original recipe because I wanted to keep it all to myself 😛 but it’s so great that it needed to be shared. If you’re going to make just one recipe from this blog, I hope this will be the one. The incredible sense of euphoria I experience from looking at a freshly unmolded soap loaf with perfect edges and smooth surfaces, or soap bars sliced into individual squares and lined up perfectly onto a wooden crate to dry, convinces me that I’m officially a soap addict, and a slight obsessive compulsive. But it’s easy for me to get really, really disappointed too when a loaf comes out with some sort of imperfection, like discoloration or uneven surfaces, and I even consider tossing it out and start over when that happens. The inner soap perfectionist in me (and this is not a compliment) can’t handle it! I don’t, of course, throw away an otherwise perfect handmade soap loaf, but I definitely experience extreme emotional roller coaster when it comes to soap making. I experienced an unbelievable high when I unmolded two loaves of all-natural Olive Oil Soap the other day. They both came out so perfect, with beautiful cream color, perfect edges, and silky-smooth exterior, and I couldn’t be happier. Then I hit the lowest low shortly thereafter when I discovered that my two-and-a-half year old daughter got to them and made giant dents on, no only one, but both loaves, while they were drying on the dining table! Noooooo! 😥 😥 😥 I was in foul mood for the rest of the day. Luckily, I was able to slice the loaves into individual squares and salvage most of them, with an exception of two with the imprints. So all in all, everything worked out fine at the end, but man, this soap-making thing is not good for my mental health! I will share more information about the Olive Oil soap on a separate post. In the meantime, I’m going to go lay down and recover now. Once in awhile, I ponder upon random things, like why the decaf version of The Original Donut Shop Keurig K-Cups needs to cost almost twice as much as the original kind which sells for $27 for 72 counts … or whether Man with the Yellow Hat will ever get together with Professor Wiseman. Or if I should name a soap based on a scent(s) or an ingredient(s), or both. Still unsure, I’m calling my new batch of soaps White Tea and Ginger Soaps for now because that’s what I used to fragrance them, but technically, they would be called Olive Oil, Macadamia Nut Oil, and Shea Butter Soap with White Tea and Ginger. But really, this is so not important compared to the love life of a cartoon character who wears the same yellow outfit day in and day out and keeps a very curious monkey as pet. I hadn’t made soaps in a while but a recent trip to Lush reignited my love for the craft, and watching the oils and lye swirl together to make a lovely soap reminded me how much I love soap making! I usually make naturally scented soaps (with Essential Oils only) but I was SO in the mood to make Lush-like, heavily scented soaps so I used a little more Fragrance Oil (FO) than usual. If you like a more subtle-scented soap, I recommend reducing the amount of FO or omit it altogether. But these soaps smell incredible — just what I needed to rekindle my love for handmade soaps! These are super moisturizing for your skin, thanks to shea butter and macadamia nut oil, and produce a gentle but satisfying lather. This is definitely one of my favorite and my go-to recipes.